Keep your hardscaping features protected this winter! 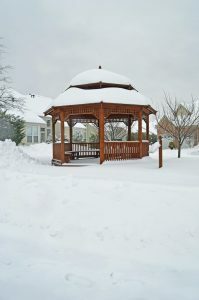 Christmas is coming up and even though snow is on the way, you might not realize the effects that winter weather has on your hardscaping features. Just remember to take your time, since any shortcuts, however well-meaning, might just lead to future problems you can’t predict. Here are four ways you can protect your home’s hardscaping features. During the fall season, it’s important to stay alert and be responsible when it comes to cleaning debris off of your hardscaping. Fallen leaves and twigs can present problems you might not think of once the cold comes. If you have patio pavers or other pieces of hardscaping, snow can wear them down and make them look dull instead of beautiful. So, before it snows, make sure your hardscaping is clean. The same goes for after it snows, too. Removing snow and ice will more than likely involve some vigorous shoveling. Be careful when you do this task. While you might quickly grow frustrated due to how tedious and time-consuming it can be, don’t let it get to you. Make sure that the shovel you use has rubber or plastic edges so it doesn’t leave any marks or other signs of damage behind on your hardscaping features once you are done. Any time you spot a crack, you should have it repaired as soon as possible. Cold weather gives way to brief moments of warmth, so freezing and thawing can make even a small crack much worse. If you need any assistance, the experts at Honeysuckle Nursery and Design can be of help. Don’t overlook the possibility of water damage. Even if the snow isn’t deep, once it melts, it’ll leave water damage behind. Help make sure that you and your family or guests don’t trip over any piles of slush you don’t see. This entry was posted on Friday, December 8th, 2017 at 5:05 pm. Both comments and pings are currently closed.